If you do not have a small child between the ages of 6 and 11, it’s likely you have never heard of Phineas and Ferb, an animated series about two stepbrothers that airs on the Disney Channel. This will not be true for long, and as proof, both the L.A. and New York Times published dueling pieces about the franchise today, cataloguing Disney’s attempts to turn P&F into the next SpongeBob. 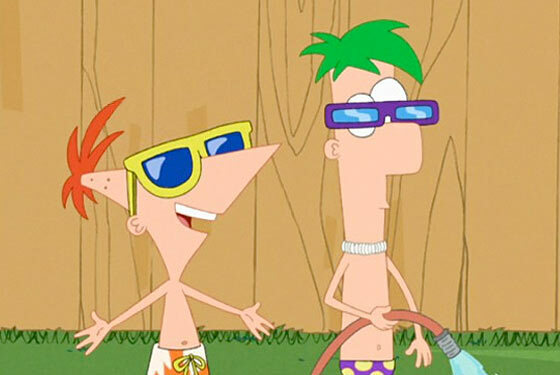 The company is unleashing 200 different types of P&F merchandise — including boxers, skateboards, and branded Kraft macaroni and cheese — at big box stores, mascots at Disneyland, videos at baseball stadiums, and a TV movie at the couch, to super-saturate us with all things Ferb-y. Lest the childless among us think this show irrelevant, P&F’s co-creator Dan Povenmire told both papers that the series is also for adults. “We don’t really care if there is a joke that goes over a kid’s head — there will be another joke coming at them in five seconds. All we care about is that the kid doesn’t want to turn the channel,” he said to the New York Times, before or after telling the L.A. Times: “Is that joke too old for our audience? … We don’t care as long as that joke doesn’t make the kids change the channel. There’s a joke coming for them in five seconds. We’re playing to the adults in the room.” In short, just as you somehow know the SpongeBob theme song, you will soon know Phineas & Ferb jams, as well as some college kids who like to get high while watching it.